Purgatory: A place or state of suffering inhabited by the souls of sinners who are expiating their sins before going to heaven. I'm going to make Purgatory a heck of a lot better place for all you sinners out there. 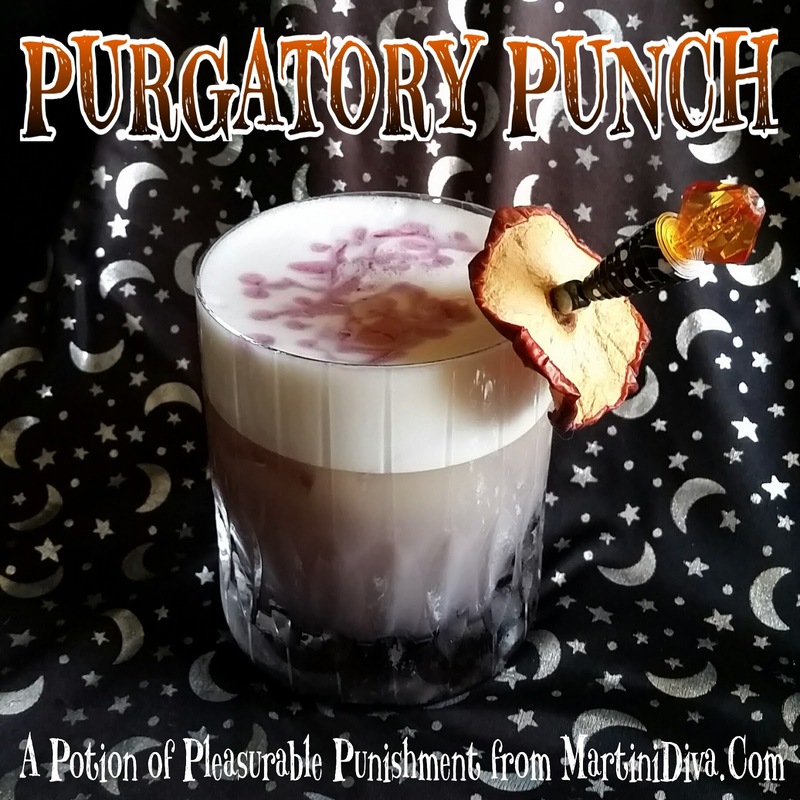 Bring your own bourbon and apples though because the prices in Purgatory are hellacious and you'll need them for this deliciously evil Halloween cocktail. DIRECTIONS Ahead of time: Make the Homemade Pomegranate Syrup as directed BUT add the 3 bags of Heart Blue Pea Flower Tea into the water, Pom juice, sugar and lemon juice to create a dark, blue-black syrup. Dry shake (shake without ice) the all the ingredients, except the pomegranate simple syrup, until the volume has doubled, approximately 2 minutes (or blend on whip for 1 minute). Add ice to your cocktail shaker (or transfer to an ice filled cocktail shaker) and shake until chilled. Pour into your chilled glass, float the pomegranate simple syrup over the back of a bar spoon on top of the foam for a fun dripping blood pattern. 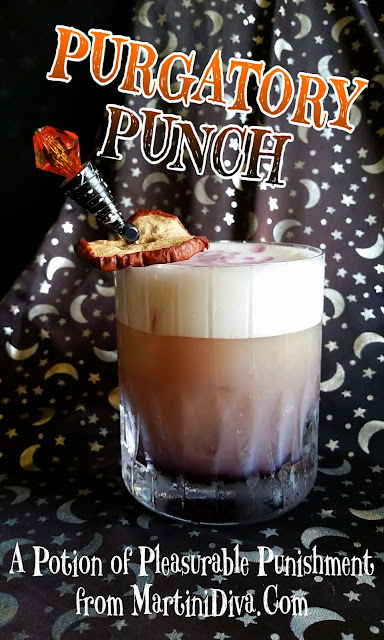 As the syrup sinks to the bottom you get a black and gray layered cocktail with floating blood on top! Garnish with a few drops of Orange Bitters and a dried apple slice then serve.